Clyde and Niki will be in their Big Cypress Gallery all weekend long. 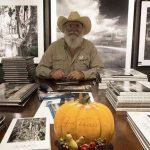 Clyde will be available for a book signing and his NEW 2019 Calendar will be there too. This will be a great opportunity to get a start on your holiday shopping. Don’t miss Clyde and Niki, as this will be their last visit to the gallery this year. This event is free and open to the public. In our front parking lot meet the Big Cypress National Park Rangers and volunteers from The South Florida National Park Trust. They will have informational tents set up. 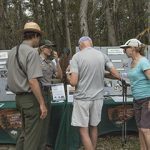 This will be a great opportunity to learn more about the Big Cypress National Preserve and hear about other phenomenal places to visit in the park. Feeling Adventurous? Join one of the guided swamp walk tours behind the gallery. Tours will be leaving every hour from 9am-3pm each day. 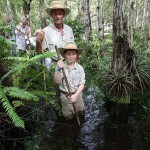 There is limited space for the swamp walk tours. Walk-ins are welcome, however admission to a walk will be based on availability. To ensure that you get to participate in a swamp walk, please sign up ahead! All proceeds from walks will be donated to the Big Cypress National Preserve Education Dept. Walks are $50 pp and kids are free. SWAMP WALK TICKETS click here . By clicking this checkbox you agree to our Terms of Service and you give us consent to use your information above to contact you and add you to our email lists.